Rising from Croatia, Animal Drive is the creation of Trans-Siberian Orchestra (TSO) vocalist Dino Jelusic. On the US TSO tour he met fellow vocalist Jeff Scott Soto. Taking an interest in Jelusic and Animal Drive, Soto pitched the band to Frontiers Music. 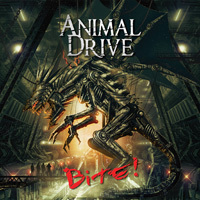 The result is Animal Drive's debut album Bite! for the popular Italian label. 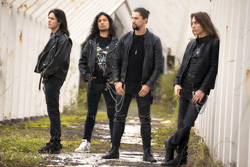 Cutting to the chase, Animal Drive plays essentially melodic heavy metal with a hard rock groove. The riffs are sharp and brisk, and lead to sizzling guitar solos. The rhythm section is heavy and powerful, giving the Animal Drive sound both rock groove and metal heaviness. As a vocalist, honestly, to me, Jelusic is an acquired taste. While he sings melodic and generally clean, he seems to sway mostly between raw and screamo. Actually, to these ears he sounded like he was picking up on the sharpness of the riffage, perhaps trying to mimic it, but instead being absorbed by it. With this combination of things, I thought most songs sounded both heavy and harsh, and not always that enjoyable. But there are some exceptions. For instance, Lights Of The Damned has this great drum line to open and then carries the song with fast rock groove. With Had Enough, the rock groove is once more bumped up, both the riffs and bass line develop the groove as well, and Jelusic doesn't sound quite as raw. And he doesn't necessarily have to sound that way. He's much more listenable on the anthem Father or the piano driven ballad Carry On. Within these songs you hear both his strength and power in the best possible way. I don't know if there was some specific reason, for his first album, that Jelusic wanted to be a heavy metal singer. It doesn't seem to be his best element; it really doesn't serve to promote his vocal style. But that's just me. Listen to the video below, and more can be found on the Frontiers Music YouTube channel. You might have a different opinion. 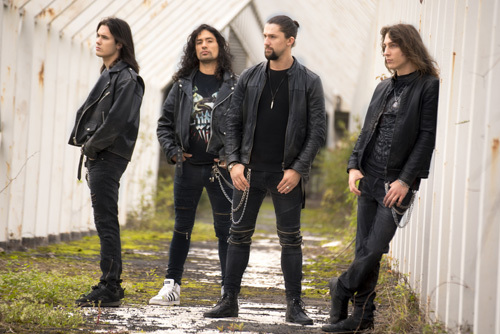 Cutting to the chase, Animal Drive plays essentially melodic heavy metal with a hard rock groove. I just wasn't all that keen on Dino Jelusic's vocal performance within the harshness of the heavy metal.